Araminta Spook isn’t like most girls her age. She lives in a huge haunted house with her Uncle Drac and Aunt Tabitha, and her greatest ambition is to meet a ghost. 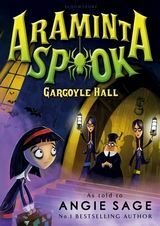 Join Araminta and her ghostly friends on their spooky adventures. Araminta Spook is just like any girl. She likes bats, ghosts, werewolves and vampires. One of Araminta’s greatest ambitions is to see a ghost, and living in Spook House with her aunt and uncle there is a fair chance she will. Then her Aunt Tabitha drops a bombshell: they are moving. The boiler is a MENACE, plus there are a few other issues relating to dust and spiders. Tabitha is not going to take this lying down and devises an array of Cunning Plans. She is determined to stay, and perhaps there is still a chance her greatest ambition will come true too . . .
Araminta Spook lives in a haunted house, but the ghosts are her friends. And her favourite ghost is Sir Horace and she wants to buy him something special for his birthday. But what do you buy someone with no hobbies, or body, for their 500th birthday? Araminta comes up with an idea for the Best Present Ever . . . but it lands her in very deep water. Will she have time to organise a party, or even see Horace or her family ever again?! When something’s amiss in the Spook household, there’s usually only one suspect – Araminta. But she know she had nothing to do with the disappearance of Barry Wizzard’s frogs, and is determined to find them (and the true culprit). The Case of the Missing Frogs is opened. But it’s not going to be easy as crazy Old Morris, a dangerous shark and a demanding – if somewhat unexpected – audience are all in the way of the truth! Araminta thinks there might be a werewolf hiding in the deep, secret passages of Spook House. To make matters worse, Uncle Drac’s creepy nephew, Max, has arrived and is now Wanda’s New Best Friend. Araminta finds him (and the situation) very annoying. BUT! She comes up with a Cunning Plan to reveal what she believes to be true – that there is more to Max than meets the eye – and also figure out what to do about that werewolf. But even the best laid plans don’t always work out quite as you’d hoped . . .
It’s Araminta’s birthday and her Aunt Tabby has won a Transylvanian holiday, which means all the adults are leaving and Araminta is going to spend her birthday alone! Until Mathilda, Araminta’s ‘grown-up’ cousin, arrives to babysit, along with two rowdy teenage ghosts. At first, Araminta and Wanda are in heaven – staying up late, playing loud music and ordering takeaways! But they soon find themselves cleaning up after everyone else. Being home alone isn’t turning out as they’d hoped. Araminta and Wanda need to come up with A Plan. Maybe then Araminta can start to have a proper birthday . . . When Araminta throws cold water over her best friend, Wanda, to disperse a crowd of panicked bats, it’s decided Araminta has been ‘helpful’ one too many times, and she is packed off to boarding school. On arrival, Araminta is surprised to discover that Gargoyle Hall makes her home, Spook House, seems positively cosy. Strange moans and clanks echo down the corridors and the two head girls are equally creepy. Most of the other pupils have been scared away, but Araminta senses that something – or someone – is behind the menace. With the help of best friend Wanda and Uncle Drac’s prize bat, she is going to do something about it! When Araminta and her best friend Wanda go on a school trip to Skeleton Island, they don’t expect to get stranded there overnight. And they certainly don’t expect the island to be haunted by ghostly skeletons of pirates! It certainly makes for a spooky sleepover. Luckily these ghoulish pirates just want someone to help them find their lost treasure, then they’ll happily set sail on their ghost ship once more. But someone else wants the treasure for themselves – can Araminta find what is lurking in the depths before it’s too late?